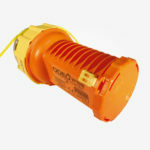 IN A DISTRESS SITUATION where long distance, low temperature and poor visibility have great importance for your chances of survival, the ODEO LED Flare is an important part of your life saving equipment. ODEO Distress Flare Wins Safety Product of the Year Award! The German Yacht Magazin has tested four LED distress flares and the Daniamant Odeo Flare was ranked as No. 1. Odeo Flare tested and voted “Best Buy”! In the recent Practical Boat Owner tests at Studland bay Daniamant’s Odeo Flare was voted Best Buy. Dive New Zealand took the unit to a depth of around 90 feet. Daniamant has entered a new sponsorship with Kayak Lasse. Lasse will be the youngest to attempt “The Red White Seal” and sail around Denmark, during the winter, in a sea kayak.